Week 10 | After School Art Program! Print our template and cut out the pieces. Trace them onto construction paper (choose your own colors, or use the colors shown in the photos), and cut out the construction paper pieces. Cut around the door and windows in the main house piece and the roof piece. The key here is to leave one side attached so that it opens. You will need to have an adult use either very sharp scissors or a utility knife to do this, as it just isn't possible with safety scissors (we tried). Glue a scrap piece of paper to the back of the house and roof (do not glue the windows/door shut!). Make sure the scrap piece of paper matches the color of the house/roof. 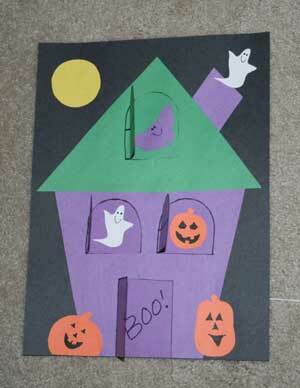 Glue the house to a piece of black construction paper. Glue all the other pieces (ghosts, pumpkins, etc.) in and around your haunted house.